A beach wander in aid of Cancer Research UK will see fundraisers saunter across six miles of sand. 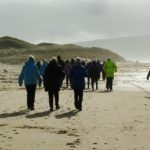 The fourth Westport Wander, organised by the charity’s Kintyre Committee, leaves Westport car park at 1.30pm on Sunday. The walk finishes at Machrihanish hall where there will be refreshments available and Christmas cards on sale. It is £10 per adult and children 15 and under go free but must be accompanied by an adult.